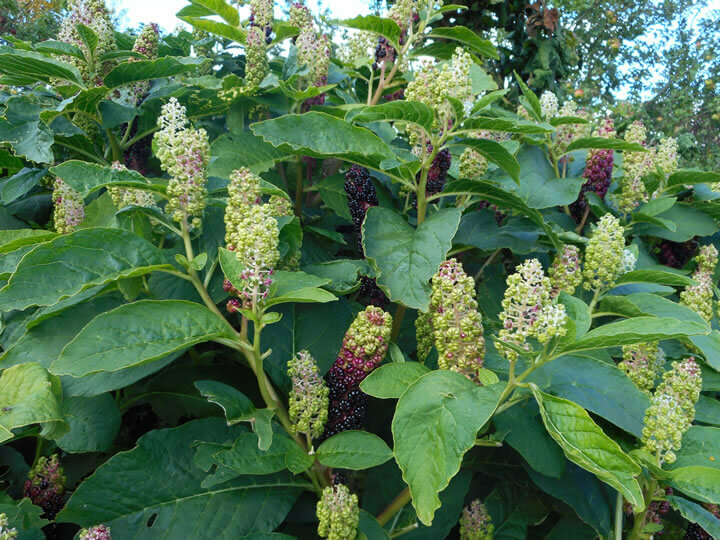 Poke, Phytolacca American is a weed that is more than a nuisance. It is an impressive plant, it is useful, and it is poisonous. It is big, bold, and particularly for good breast health. As October is Breast Cancer Awareness Month, it is a perfect time to write about it. It just happens to be everywhere in the landscape around here. The roots, just ready to harvest as the plant begins to die back. The root is easy to dig as it generally finds itself in loose sandy soil. They can be as big as your arm. I have to chop them up right away or they become too fibrous to work with. It is a plant that grounds you and is an important healing ally. Poke leaves, when very young and tender, are boiled and eaten as “poke salet’.” Most folks say “poke salad” and buy the stuff in a can. It is common in the south. Doug Elliott, in his book Wild Roots, talks of taking small bits of the root, giving it enough room to sprout in a cellar or basement, enjoying the young shoots all winter. The plant has an amazing physical stature, as you can see from the picture. These were 12 feet tall. The bright red stalks are fibrous and hollow and amazingly strong. The berries begin a bright green, then turn to a blazing purple. These berries are “toxic” when eaten unless you’re a bird. They seem to like the very bitter fruit. The Cherokee people used these berries as a lymphatic tonic before winter set in by consuming berries in a prescribed manner. A healthy lymph system is critical for good breast health. And…they make a lovely natural ink or dye. The root has a very specific role in good breast health. It is known, when applied topically as a poultice or a salve, to be helpful in dissolving fibrous or cystic areas in the breast. It is anti-inflammatory so may relieve congestion and swelling. It has been used in this way for millennia. I infuse it in organic olive oil with St. John’s Wort and Calendula to create my product BreastBalm. This soothing salve was specifically designed for breast massage, daily or monthly. Poke should be used with care by nursing mothers. Though it may be helpful for congestion or inflammation in the breast, it is too “potent” or toxic for baby. We should teach our children that the berries are beautiful but not to be touched nor should the leaves be eaten. Use caution but DO use this plant. It has so many beneficial uses. It is beneficial in lymphatic cleansing, urinary tract cleansing, colon cleansing and the breaking up of “cysts” or “fibroids” or other congestion in the body. Applied topically it is relatively safe. Used internally it can be extremely toxic. Consumption of the root, in just a small dose, will create intense vomiting, sweating, and explosive bowel movements and urinary tract cleansing. I know as I mistakenly ate some once thinking it was burdock. Whew!!!! I felt “clean as a whistle” and good, but this is not a “cleanse” for the weak of constitution. I did feel better then I had in a very long time, but that was after 72 hours of some intense stuff. Worth every minute of it!! !